Apple iPhone 8 hands-on hands on review | What Hi-Fi? The first question that springs to mind is, why would you buy the iPhone 8 when the iPhone X is available? But, as it happens, there are plenty of reasons. For a start, the iPhone 8 is much more affordable and, if you’re not too concerned about the all-screen front of the X, the 8 is a good-looking smartphone. 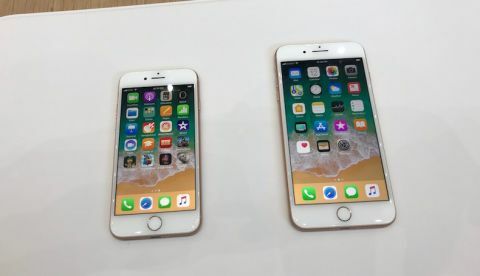 From the front, the iPhone 8 essentially looks a lot like its predecessor, the iPhone 7. Although the bezel is way bigger than the one on the iPhone X, it’s still a slick, classy-looking handset. Dimensions of 14 x 7 x 0.7cm (hwd) are not abnormal by smartphone standards, and the 4.7in screen has a 1334 x 750 pixel count – which shakes out at 326ppi. Contrast is a claimed 1400:1. There have been a few key design improvements too. One example is the way the antenna band now blends in much better with the overall design, whereas previously it was in stark contrast to the phone itself. But the real style change is evident when you flip the phone over. The back of the iPhone, which has been aluminium since the iPhone 6, is now made of glass. The silver, space grey and gold finishes gleam subtly, and the Apple logo is colour-matched, giving an overall coherence to the phone. Available with either 64GB or 256GB memory, the iPhone 8 also has an improved 12MP rear camera, which is larger than before and promises to be faster, too. Apple has put an image signal processor of its own design in the new camera, plus improved flash - which, it says, will provide a more uniformly lit background. Wireless charging is now a standard feature for all new Apple phones. Contrary to rumours, it works with all charging mats using the Qi (pronounced Chee) system. Though it's not a new feature, wireless charging has never really taken off until now, but the iPhone 8 could be about to change that. The iPhone 8 is water- and dust-resistant (IP67) and the new processor (A11 Bionic) promises to make the phone fast and responsive. In the demonstrations we saw, that certainly looked to be the case. The picture quality on the new iPhone 8 is, largely similar to that of the 7, but there’s one important exception. The new Retina HD display adds True Tone, so ambient light is monitored and matched to provide a more natural effect. At first, it looks like a subtle change – until you turn it off and see how blue the screen previously looked. It works as well here as it does on the iPad Pro, and it’s good to see Apple bringing this feature to its phones. Video recording is available at up to 4K quality (24, 30 or 60fps). We haven’t been able to test the audio in a suitable environment, but Apple says the stereo speakers have been redesigned to offer deeper bass and go 25 per cent louder than the speakers on the iPhone 7. The iPhone 8 will run iOS 11, and all indications are it will support FLAC digital audio files. How Apple intends to exploit the possibilities of the FLAC format, in terms of resolution and so on, is yet to be confirmed. But the addition of FLAC seems to have called time on both WAV and AIFF compatibility.